Plants 2-6 cm high, chalky pink, forming tufts of erect, neatly bipinnate axes with a crustose base. Genicula inconspicuous. Intergenicula in main axes cylindrical below, becoming somewhat flattened and wedge-shaped above as result of lateral widening at distal ends where branches are borne, 0.8 to 1.2 mm long, 500-600 µm wide at bases, 800-1100 µm wide at distal ends; branchlets terete, up to 6 mm long, 200-300 µm in diameter, fertile branchlets terminal, short with swollen tips (conceptacles). Adventitious branching not seen. Epilithic, on exposed shores in the lower eulittoral and sublittoral fringe. Recorded from Plettenberg Bay to Port Alfred (31-39). World distribution: Fairly widely distributed in warm temperate and tropical seas (Guiry & Guiry 2014). The recorded localities range from tropical through to sub-Antarctic, suggesting that the species needs further taxonomic study. Type locality: Chile (Silva et al. 1996). Note: Except for one specimen (see below) we did not recognize this species in our collections, although it is recorded from the literature. There are 4 specimens in BOL labelled “cf berterii”, but two are useless fragments, and one appears to be a Haliptilon (now Jania). Only one (Keurboomstrand, coll & det Stegenga, BOL #16180), appears different to C. officinalis, and fits (to a reasonable extent) Kutzing’s type description and Harvey’s description in Nereis Australis. These descriptions and this specimen are used here. We do not know if this species is represented in the DNA barcoding study of Kogame et al. (2017), which identified two Corallina clades among (limited) South African samples. 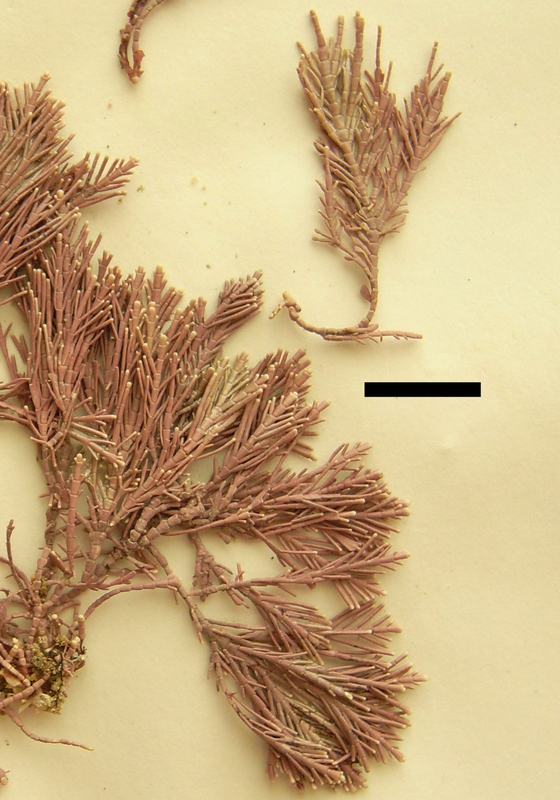 Any decision should await DNA analysis of C. berteroi from Chile, the type locality. Corallina berteroi, detail (smallest scale divisions 1 mm). Corallina berteroi, detail (scale bar 10 mm). Guiry, M.D. & Guiry, G.M. 2014. AlgaeBase. World-wide electronic publication, National University of Ireland, Galway. http://www.algaebase.org; searched on 12 March 2014. Kogame, K., Uwai, S., Anderson, RJ., Choi, H-G & JJ Bolton. 2017. 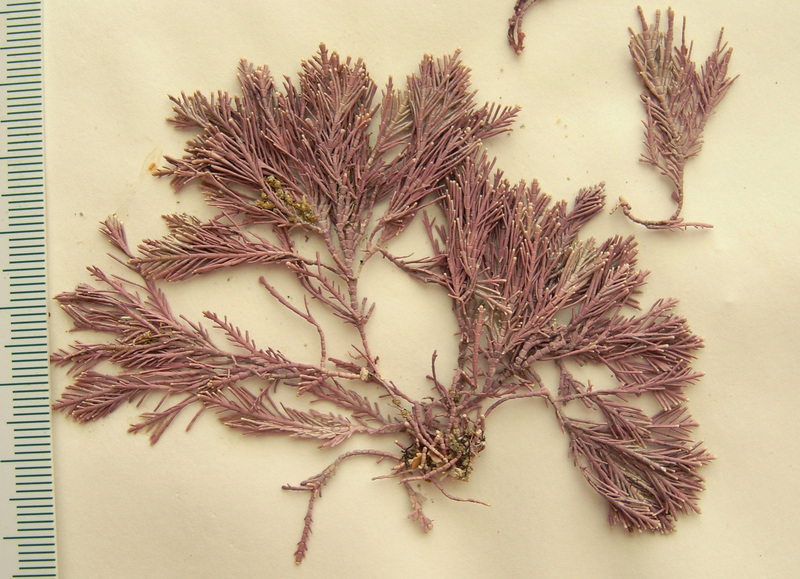 DNA barcoding of South African geniculate coralline red algae (Corallinales, Rhodophyta). South African Journal of Botany 108: 337-341. Kützing, F.T. (1849). Species algarum. pp. [i]-vi, -922. Lipsiae [Leipzig]: F.A. Brockhaus.